A brown Barcelona chair is a chair no one can turn down. Beautiful brown leather combined with steel, wrapped in a timeless design adds something to every home. What makes the brown Barcelona chair different from for example the black or white version is that it’s a warm color which allows the chair to create a nice atmosphere. Don’t expect a rough style in your home, but livable modernism. Brown leather is known for getting even more beautiful when it gets used a lot. The more you use the chair, the prettier it gets. Don’t hesitate to relax in this chair for hours. Do note that not every brown Barcelona chair is the same. Some “brown” Barcelona chairs are lighter (cognac) and some are more of a darker, almost black, brown. Of course you can choose for the classic chair, but to achieve an even better sitting experience you can choose to order an ottoman (footstool) with your chair. Up with your legs & dream away! Another option is to get cozy on a two-seater version of the brown Barcelona chair. Create a lounge area with one of these chairs, or put it somewhere else in your home as an eye catcher. In your bedroom or the living room for example. A lounge area completely made up of just Barcelona Chairs is the dream of every design furniture fan. Combining different colors is another option! How about brown and white? A brown leather version of the Barcelona Chair is a version of the Barcelona chair that gets a lot of love. This is mostly because the brown Barcelona chair isn’t available at Knoll and you’ll probably end up buying a vintage version. ‘Vintage’ often makes you think of an original Mies van der Rohe design. But, when you’re searching for a vintage model you have to be careful, because the chance is high that you’re dealing with a fake one. Original models can cost up to €15.000,-. Most people will choose to buy a good replica version of the chair. 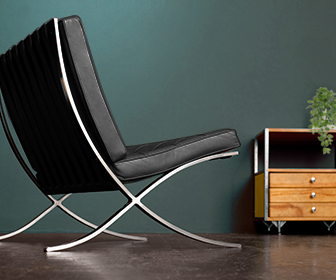 There are some differences with the original chair, but often times they’re very minimal. Replica Barcelona chair tend to greatly differ in quality, so do some research before you buy one! If a deal seems too good to be true, it oftentimes is. We highly recommend BarcelonaChairShop.com if you’re looking for a reliable shop to buy your replica Barcelona chairs.